A Five-year plan to replant mangrove forests is being undertaken on the Rakhine State coast with the help of the Danish government, a Forest Department official said. U Toe Aung of the department’s Mangrove Conservation Unit said the five-year project will focus on degraded mangrove forests in Myebon and Rambre townships. It started in June 2018 and will end in 2023. 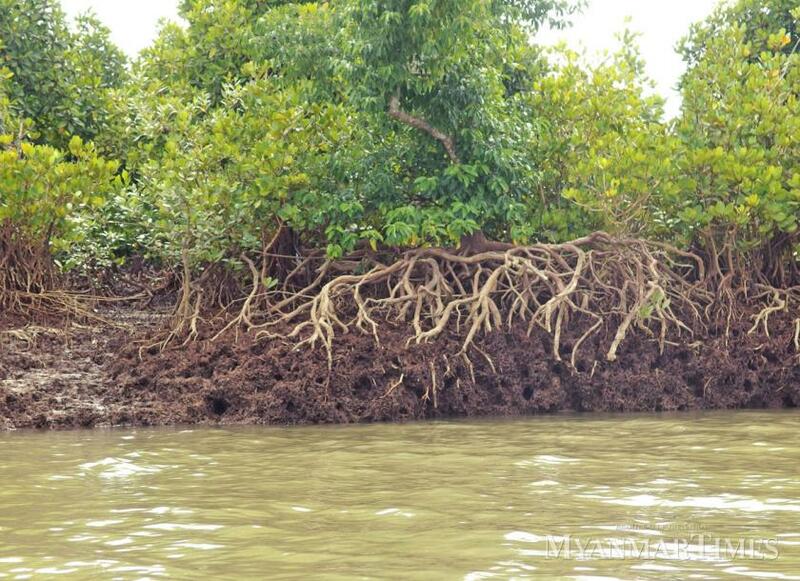 According to the department, mangroves cover 76 percent of Rakhine’s coast, 29pc of the Ayeyarwady delta, and 98pc of Tanintharyi Region in 2015. But conservation experts said many mangroves are being destroyed to breed fish and prawns, and farmland. “Mangrove forests in Sittwe township are now prawn farms. We will replant mangroves in prawn farms that are no longer used,” U Toe Aung said. One problem is that mangroves, forest reserves and protected areas have not been clearly defined, and group-owned forests have not been established in Sittwe, he added. “In Sittwe, we plan to define them. People think that if a forest reserve is clearly defined, the government owns it and they have no right to it,” U Toe Aung said. “We will conserve these areas for the long-term public interest. Locals can apply to sustainably use them as community forests. Once they get approval, people outside the community will not be allowed to enter the area,” he added. The Danish government is also involved in the conservation of mangroves in Tanintharyi’s Myeik archipelago and Kyunsu township. The mangrove rehabilitation is aimed at mitigating the effects of climate change on coastal area communities, U Toe Aung. “In Tanintharyi, there has not been much mangrove deforestation, but the quality (of the trees) has declined,” he said. The project will mainly focus on extending nature conservation areas and training locals. By protecting and re-establishing the mangroves, which is the habitat of marine animals, locals would be able to sustainably use these resources. Maung Maung Kyi, chief of the Rakhine Coastal Region Environmental Conservation Team, said that locals need to cooperate in the conservation work, as the project can create jobs and boost their incomes. He noted that one threat to mangroves is the cutting of trees for firewood. “Most of the firewood for brick kilns is produced in Wunbaik Forest in Rakhine’s Kyaukphyu township. The area is facing many threats. The main thing is for locals to conserve these forests. This area has more natural mangrove forests than planted trees,” he said. With an area of more than 2500 square kilometres and a wide variety of rare mangrove species, Wunbaik is the only forest reserve in Rakhine. But it has seen an increase in illegal logging recently. The government has intensified efforts to rehabilitate mangroves across the country, as they serve as barriers to tidal surges. Myanmar was ranked second among the countries that suffered severe natural disasters, according to a study of the impact of global climate change published in 2016. The country is particularly vulnerable to cyclones that can generate tsunamis, floods and a rise in sea levels.